The Pairwise Intersect tool calculates the intersection between the features in two feature layers or feature classes using a pairwise comparison technique. The features, or portion of features, that are common to both inputs (that is, they intersect) are written to the output feature class. With Pairwise Intersect, one feature from the first input is intersected with each individual feature in the second input. This is fundamentally different than how the Intersect tool works. With Intersect, all features are intersected regardless of what input layer the feature belongs to. All overlaps (intersections) among all features are calculated, regardless of what input feature layer they belong to. Because all intersections are calculated, it is possible that the output contains many more features than the count of all the input features combined. There are many cases where the inputs, all together, contain tens of thousands of features, but the output contains hundreds of millions of features due to the complex overlaps that exist between all the features. For example, two feature layers are illustrated below. One contains 10 features—buffers around points, and the other contains one feature—a square. 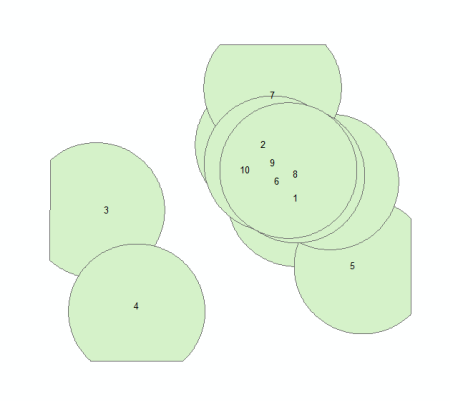 Input 1 contains 10 overlapping polygon features, labeled by OID. Input 2 - 1 polygon, labeled by OID. The illustration below shows the result of Intersect with the two feature layers above. Note that all overlaps (intersections) among all features are calculated, regardless of what input feature layer they belong to. This can result in many more features than found in the original inputs. 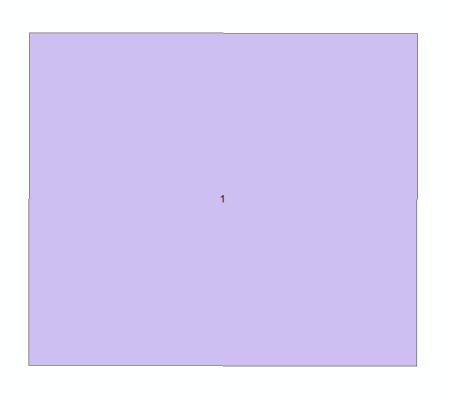 There are more polygons in the output (167 features) than were in the inputs combined (input total was 11 features). This increase in the number of new features in the Intersect tool, output can grow very quickly, depending on the complexity of the overlap in the inputs. Intersect tool output: 167 output features, labeled by OID. With the Pairwise Intersect tool the output will be much simpler. Each output feature is the intersection of one feature from input 1 and a feature in input 2. 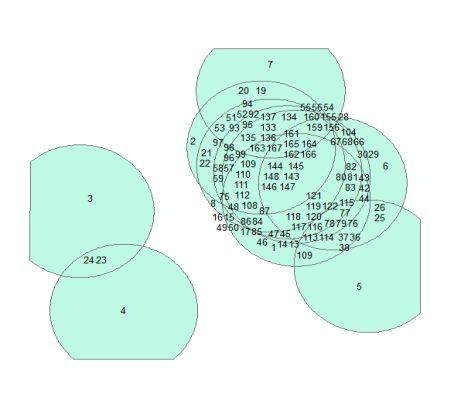 With the Intersect tool, intersections among features in input 1 are calculated but not with Pairwise Intersect. Pairwise Intersect output: 10 output features. The graphic below illustrates the result of intersecting two polygon feature layers with the Output Type parameter set to Point. With the Intersect tool, the output point features are where a polygon from one of the input feature layers has a vertex intersecting the boundary of a polygon from the other input feature layer. With the Pairwise Intersect tool, the output point features are where a polygon from one of the input feature layers has a vertex touching the boundary of a polygon from the other input feature layer. 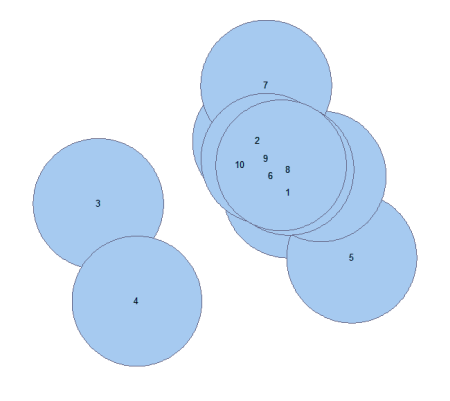 Points where the polygons cross are not returned. The Pairwise Intersect tool may give you substantial performance gains when intersecting massively overlapping features. For simple cases where the amount of overlap is minor, you may not see any performance gains by using the Pairwise Intersect tool. Keep in mind that the output is very different between the two tools. You may want to experiment with small subsets of your data in order to analyze the output and determine which tool meets your analysis needs. The Intersect tool is a highly complex tool to find unique incidents of overlap between all features in the inputs. Considering the complexity of this type of operation, Intersect is extremely efficient and scales extremely well. If you need to find unique incidents of overlap between all the features in your inputs, the Intersect tool is the best tool for the job. Determining which tool to use is a question of speed and which output is suitable for your analysis. If the Intersect tool completes in a reasonable amount of time and creates output suitable for your analysis, then continue to use it. If, however, the Intersect tool does one of the following, then you may want to investigate using the Pairwise Intersect tool, providing the output it creates is suitable for your analysis.